Are You Mine and No One Else’s? Issue #233 • October 12, 2017•Buy Now! Everyone was bombed on whiskey sours, some girl puked in a closet of old suits, another joint found its way to Rhoda’s fingers. Suddenly it was two in the morning and there she was, slow dancing with a guy named Tony to the new Van Halen record. It was one of those come-one, come-all parties, but still: who was he, someone’s older brother? His mustache came in as thick as carpet shag and when he smiled the skin at the corners of his eyes wrinkled over like the surface of a lake. He held her firmly by her hips and rocked her gently from side to side. They were laughing so hard they had tears running down their cheeks. She pressed her waist to his and they danced to the whole album, beginning to end. A week later, they had their first official date. They went to the mall, ate food court Chinese, and scoped out the record store. She was nervous his age would show when they ran into a couple of her high school friends, but Tony was super cool. He stuck his hands in his back pockets and smiled and joked along. Danny Lorberbaum is a graduate of Bowdoin College and the MFA program at Hunter College. His work has appeared in Virginia Quarterly Review, Guernica, and Southwest Review, where it received the McGinnis-Ritchie Award. He has been a fellow at the MacDowell Colony and an Emerging Writers Fellow at The Center for Fiction. Patrick Ryan on Are You Mine and No One Else’s? One of best things about reading short stories and novels is that we get to spend time with people we wouldn’t actually want to know. This applies to out-and-out villains, of course, but it also applies to jerks, narcissists, bigots, whiners, chronic interrupters, what have you. Spending time with such types via the written word is great not only because we get to observe them without having to be in the same room with them, but also because we get a chance to be in their heads for a little while and better understand what it’s like to be them. The feeling may only last for as long as your eyes are moving across the page, but there it is: empathy, no strings attached. Our new issue takes us into the heads of two different characters—Rhoda and Tony—and I’m guessing you might not want to be besties with one of them. You will, however, be on intimate terms with both of them by the last sentence, and I wager you’ll see a little of yourself somewhere along the way. Mix longing with possessiveness, desire with performance anxiety, second-guessing with secret-keeping, skinny-dipping with fast driving, and project it all onto a backdrop of America in the early days of the Reagan administration, and you’ve got “Are You Mine and No One Else’s?” by emerging writer Danny Lorberbaum. The goal of One Story, first and foremost, is to put great short stories into readers’ hands. Along the way, we often make readers aware of writers they might not yet have come across. 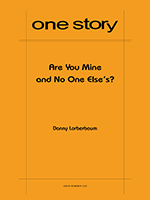 I’m confident Danny Lorberbaum is at the beginning of a vast and impressive writing career, and I’m thrilled to be sending you “Are You Mine and No One Else’s?”—a story I find as charming as it is unsettling. DL: Two places: one intellectual, one emotional. The intellectual place had to do with a mood that I’ve found in certain works of art about America in the 1970s, most notably for me Stephen Shore’s photographs and Norman Mailer’s novel The Executioner’s Song. Visually, I’m thinking of prairies, cars, parking lots, highways, gas stations, neon signs, sky, but it’s something deeper than just what’s seen. I’ve always wanted to capture this mood in my own work, and when I started this story I really hoped I’d be able to get it right. As for the emotional side of things, it’s actually very personal. Tony and Rhoda are based loosely on my parents, who married in St. Louis in the early 1980s. The age difference between the characters is the same, and my dad was (and is) a butcher at a grocery store. But the truth is that I don’t know much about how they met or the way their relationship developed or exactly what kind of people they were back then. I think that a major reason I wrote the story was to try to understand them better, even though they’re not Tony and Rhoda. I strongly believe that if a work of fiction doesn’t come from an emotionally true place then it’s worth nothing. PR: I couldn’t agree with you more on that one. So we have Rhoda, her mother (Maryann), and Tony. Not a love triangle by any means, but a triangle nonetheless. And at the very end, the story zooms in tight on just one of those characters. Was it always going to end like that? DL: No. In the first draft Rhoda goes missing and it seems pretty obvious that Tony killed her, then he and Maryann kind of get together. There was an ambiguously romantic scene at the very end in which Maryann visits him at the meat counter and he gives her a discount on a rib eye. The mood was there, but I hadn’t completely done my character and motivation homework that I can see now was so essential. PR: What surprised you the most about the story or the characters, as you drafted and revised? DL: This is a really interesting question because, for me, so much of writing is done at a very basic sentence level, just sitting in front of my computer for hours every day. I want the words to be correct in and of themselves and also to fit together as perfectly as possible, so it’s crazy to take a step back and look at what was going on in the first draft, which I wrote eighteen months ago at MacDowell, and then again in the third, and then now, and see an entirely different character from the one you meet in Draft One. I’m thinking about Tony. He started violent, quiet, and mysterious, and grew into someone with much more depth. At first I was afraid to let him talk. I thought it might complicate the story for me and grow into something I was no longer capable of writing. PR: That sort of enormous change from draft to draft has happened to me before (at least once, that I can think of), and it’s one of the most interesting things that can happen if you’re willing to spend a lot of time with your characters (time that, thankfully, doesn’t end up represented on the page). Does the story now “belong” to any one character? DL: I have a line in my notebook from a week before I started the story that just reads, “Tony,” but the first line that I wrote was about Rhoda: “She’d gotten ready too early and the living room had grown dim around her; the only light came from the TV.” To answer your question, though, I’ve always thought of it as Tony’s story, but it evolved over time to become Rhoda’s as well. Without the moments from her point of view, the whole thing falls flat. PR: There’s a wonderful grittiness to the various interiorities at play here, an informal rendering of thoughts that feels very genuine and is often touching and funny. I’m talking about phrases like “She held the smoke in until her lungs screamed goddamn you,” or “It smelled like cooking.” Do you think that’s a style particular to this story, or is it part of your regular writing voice? DL: Those phrases are definitely characteristic of my style. I write about many different kinds of people. In my collection from which “Are You Mine and No One Else’s?” is taken, there’s a Swedish logger (late 1800s), a one-armed night porter (1940s), and teenagers living in the rural Midwest (1990s), but in every story I hope the reader will be able to find lines like the ones you’ve very generously pointed out. I’m talking about moments when readers forget they’re even reading and are just there with a person—not a character, but another person, listening to them and seeing what they see, even if that other person happens to not be real. It’s a privilege and a challenge as the writer to try to gain access to that other consciousness and its experiences. To my mind, that’s the most beautiful thing that writing or reading fiction can do. PR: One of things I admired from the get-go in this story is the pervading sense of menace—or potential menace. It’s one of the engines at work here, regardless of whether or not it comes to pass. Was that intentional, given that you took out the suggestion of a murder many drafts ago? DL: Yes. I first experienced a sense of menace—or potential menace—in a profound way when I was about seven years old, spending an afternoon with my grandma. Earlier that day I’d seen a news story on TV about a little boy who’d been kidnapped and murdered, and everything thereafter had a sinister glow. For my grandma and my cousin, it was probably a perfectly nice day. The radio was on, and I remember my cousin dancing while I just sat on the couch, trying to act normal. It was the first time in my life that I really understood there was bad in the world. That feeling is what I wanted to tap into in this story. PR: What are you working on now? DL: A false true crime novel set in coastal Maine. PR: I’m tempted to ask you what “a false true crime novel” means, but I never want to encourage a writer to talk openly about a novel-in-progress. (Too many potential risks.) What is the best bit of advice about writing you have ever received? DL: My agent, Frances Coady, once told me to pay attention to how I feel when I’m in the process of writing. Those words themselves aren’t so difficult to understand, but performing what they ask is extremely challenging. It’s about judging for yourself whether or not a piece is working. In my experience, that’s almost impossible. It’s a feeling that goes beyond craft.